In severe winter weather pipes under sink cabinets, in exterior walls or in unheated spaces like basements, are the most vulnerable to freezing. Here’s how to find the problem and fix it. 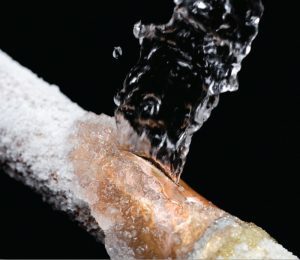 A trickle of water when a faucet is fully turned on is the easiest sign of a frozen pipe. To find the frozen section, move backwards from the faucet. You can use a space heater near the pipe, a blow-dryer on low, or wrap the frozen area with a heating pad or towels soaked in hot water to thaw the pipe. Never use an open flame from a propane or kerosene lamp as pipe fires can be caused by overheating. If the pipe won’t thaw, don’t wait to call a plumber. A freezing pipe that bursts can be a homeowner’s worst nightmare. It can spill hundreds of gallons of water per hour. Here are some tips to handle a burst pipe to keep damage minimal. First, turn off the main water sources in your home, then find the damaged pipe. Turn off the furnace, hot water heater, and electricity in the flooded area, and unplug any turned off electrical items, placing plugs above water level. Put valuables and important papers on higher ground, and put area rugs outside or in the bathtub. Soak up water with towels and/or a mop, then use buckets if necessary and a wet vac for carpets if available. Once most of the water has been removed, use fans and dehumidifiers to dry out the room. you can open windows if the outdoor weather is mild and not humid or raining. Hazardous mold can begin to grow within a few hours so it’s important to work efficiently. Check the drywall, ceiling, insulation, and flooring to assess damage, and take photos of the damaged areas for insurance purposes. 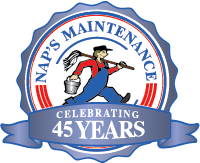 Once the situation is under control, call a plumber to fix the pipe, your insurance company to start your claim, and a company like Nap’s Maintenance Service if you need further help repairing your water damage.